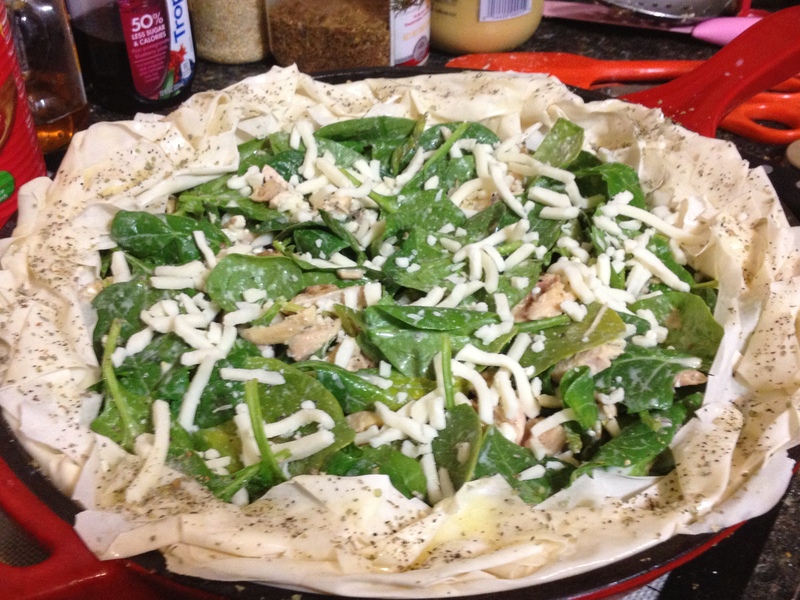 Weeknight Cooking…Trust Me, this is EASY! What Kita's Cooking…Yes, it was Delicious! Cold weather makes me tired. Well, if I am being totally honest, it makes me lazy. All I want to do during the winter months is NOTHING! The thing is, I am so not afraid to admit that. I own my lazy, embrace it, hug it tight like a long lost friend. Unfortunately, even though I would love to come home and do nothing, I have a family and they like to eat…every day! The next couple of posts will be quick and easy recipes to help you get through your laziest days looking like a kitchen rock star! Up first is my Chicken and Spinach Pie. 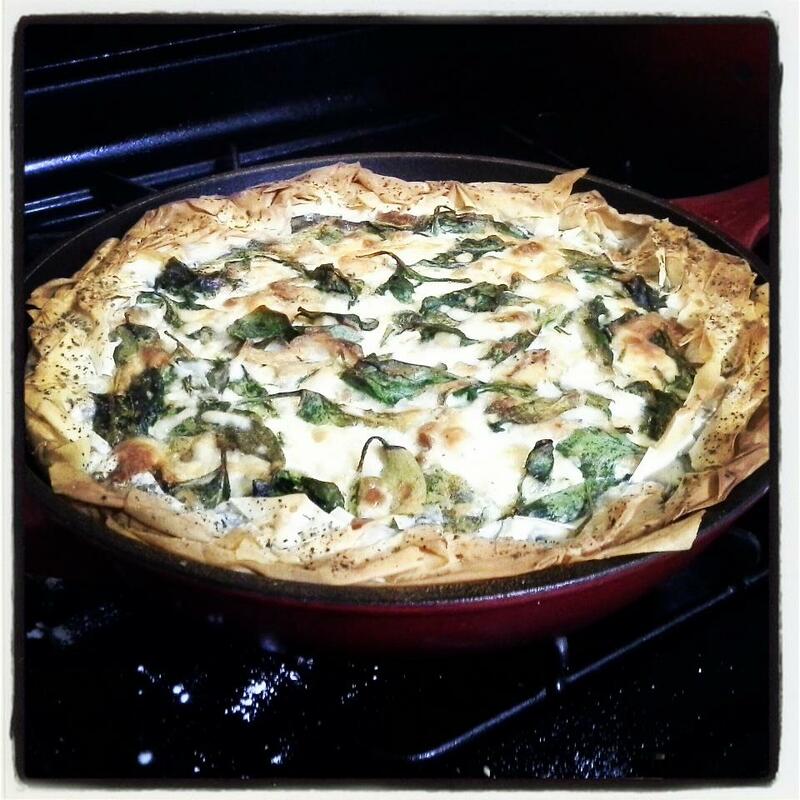 It is kind of like a quiche and a spanakopita had a love child. I use left over lemon chicken, but a precooked rotisserie chicken, or any left over chicken would suffice. This recipe is very easy, which allows for time to make it pretty, thus giving the impression that you slaved over the stove to create it! I say use this to your advantage and get somebody else to do the dishes!! As always, if you try the recipe, let me know! I love to get feedback!! 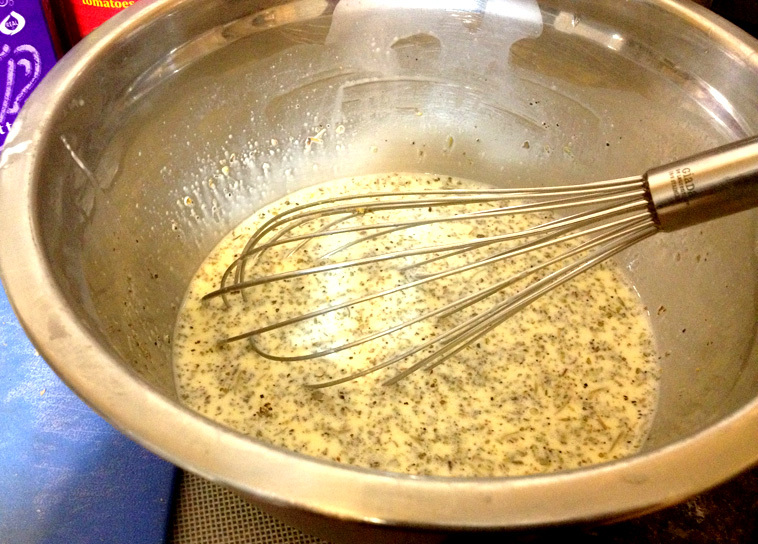 In a large bowl, mix together, eggs, milk and cream, herbs, salt and pepper. 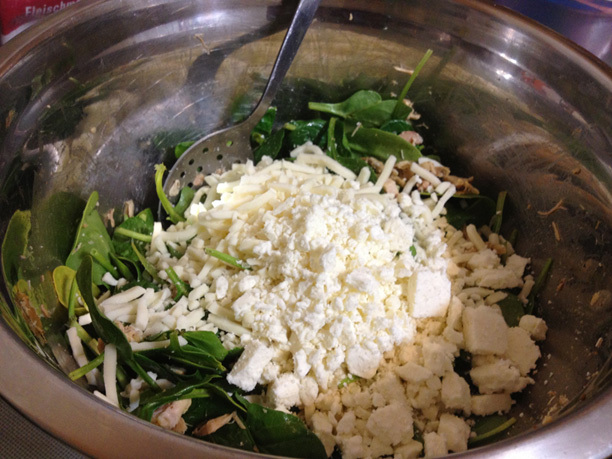 Add cheese, chicken and spinach, mix well. Set aside. OK, I used my large cast iron skillet, but a deep dish pie pan would also work. 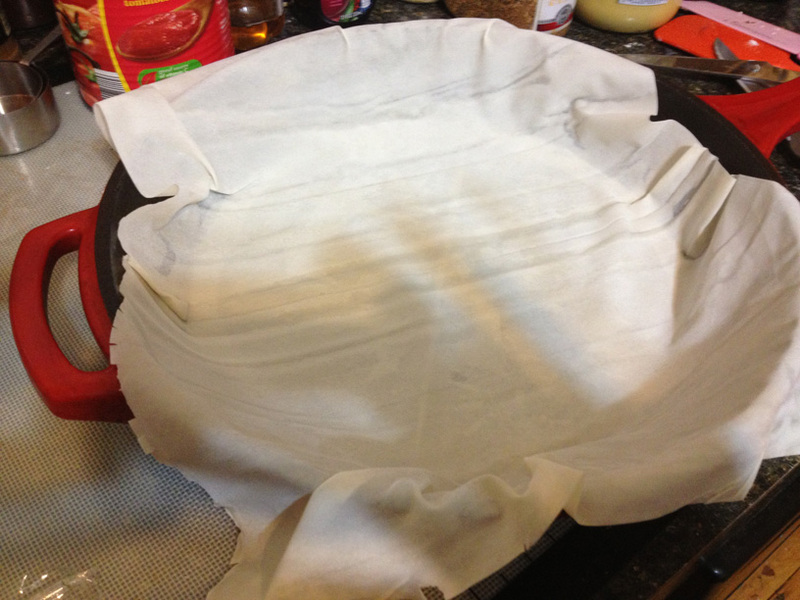 Cut out a circle of parchment paper to line bottom of pan. Use a non-stick cooking spray to cover sides and bottom of pan. 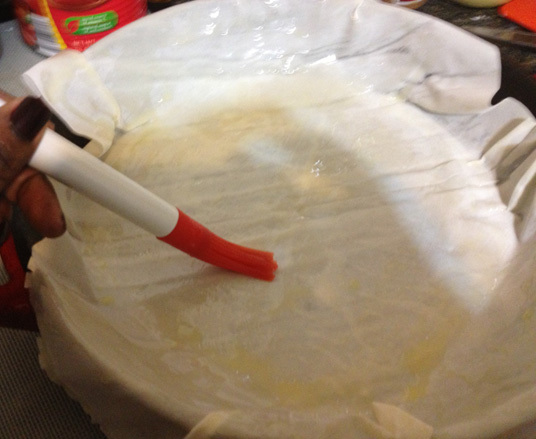 Add parchment paper to line pan. Take first sheet of parchment and cover pan, tuck bottom so that sheet is flush with pan. Brush sheet with melted butter. 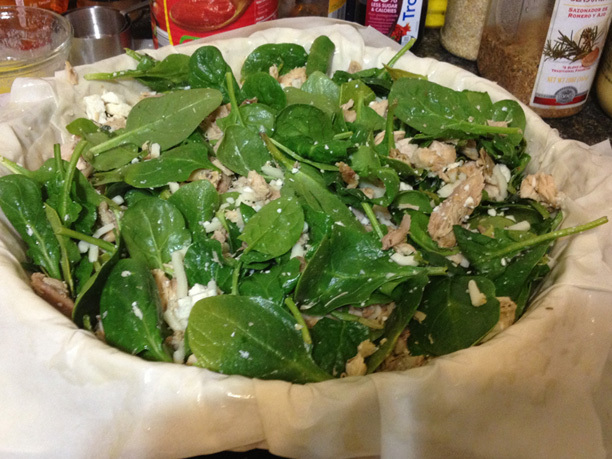 Lay second sheet in pan, in the opposite direction. Brush with melted butter. 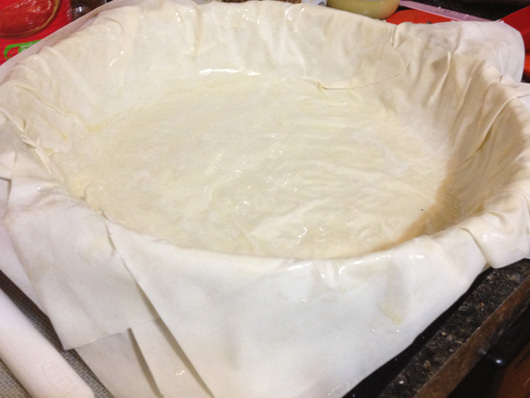 Continue until all six sheets have been placed in pan. Once filling has been added, now comes the time to get creative with the crust. I fold and crimp the edges so that they almost resemble leaves or petals. (At least that what it looks like in my mind). After assembling edges, brush with butter and sprinkle with herbs, because that looks pretty! Bake in 375 degree oven for 30 minutes, or until middle is set. Remove from oven and allow to set for at least 10 minutes before serving. Stay updated with my latest ramblings and recipes! © 2019 What Kita's Cooking...Yes, it was Delicious!